A learning space for futurists of ASEAN. 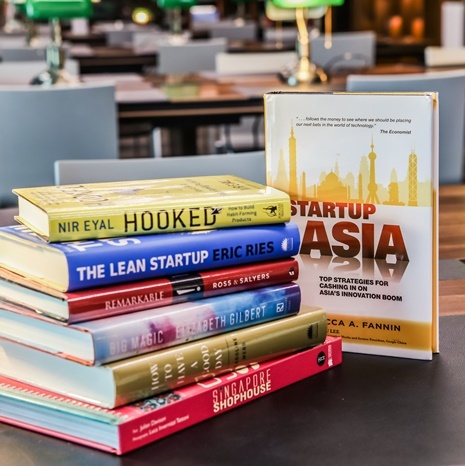 Our members are given the opportunity to discover a wide selection of books, magazines, and e-resources on business, arts, culture, all things ASEAN. Our Meet & Read and Reader2Leader serves as a platform for our community to connect with thought leaders and create inspirations together. Meet & Read’s goal is to create and strengthen reading and writing society by inviting a successful individuals, both in business conducts and book writing, and people who are interested in reading and writing to be in the same place. The activity aims to become a platform for learning and exchanging of knowledge and idea from each other, creating inspiration among people who are interested in the same thing. During 2016, five Meet & Read were held with over 300 participants attending. All of which received positive feedback were given from participants. As for 2017, Mind Space aims to expand the activity by co-operating with other organizations and institutes, such as universities, libraries and other corporate social responsibility (CSR) that suits our speaker’s will. We also aim to broaden the type of content and speaker to serve a more diversified audience. “Today a Reader, Tomorrow a Leader” – this philosophy serves as the inspiration for building a platform for the exchange of ideas and experiences among likeminded individuals. Set in the form of small discussion groups, our leaders will “pick a read” or select a book of their choice and invite fellow readers in a mind stimulating and thought provoking, informal discussion. Launched in 2017, our first Reader2Leader focused on “Thai Brands – AEC: What’s Ahead?”, a book aimed at providing a strategic game plan and a way forward for doing business in ASEAN. Founders of two of Thailand’s notable startups were invited to share their experience of penetrating various ASEAN market to apprising startups and entrepreneurs.